We think that risk assets have now reset to more attractive levels andsome “entry points” for long-term investors are materialising in emerging market (EM) assets and developed market (DM) credit, both of which suffered brutal valuation resets last year, the former in the first part of 2018 and the latter at the end of the year. 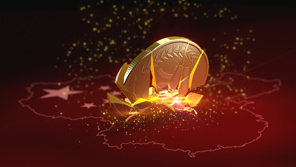 European equities could follow in this “entry” sequence, but we believe more robust opportunities will materialise later in the year as the European elections in May (and Brexit) could continue to weigh on investor sentiment. The nearing end of the Fed’s tightening cycle and the stabilisation of the US dollar would undoubtedly be extremely favourable elements, as would a decline in geopolitical tensions or a scenario of economic slowdown without recession risk. A 2% threshold for US growth and 3% for global growth are key levels to support our view on risk assets. We are aware that risks have not disappeared: there are many geopolitical hotspots and global debt is skyrocketing. This means that a strong focus on the sustainability of earnings and debt is needed to build resilient portfolios. In EM, in terms of ranking of return potential for 2019, we see equities as the most appealing, followed by EM bonds in local currencies(LC) and hard currency (HC) debt (with LC debt expected to be more volatile than HC debt).This is a change of view compared with last year, when the pressure on currencies had been too high and we were very cautious on EM debt in local currencies. In terms of the investment approach for this market phase, we think sensitivity to multiple themes (external imbalances, electoral cycles, domestic growth engines and trade disputes) will be the key to driving selection in the EM space. In DM credit, some value has been restored too, amid more dovish central banks and still decent economic fundamentals. European credit (especially in the primary market) will be the main brick to deliver returns in European fixed income portfolios in 2019. 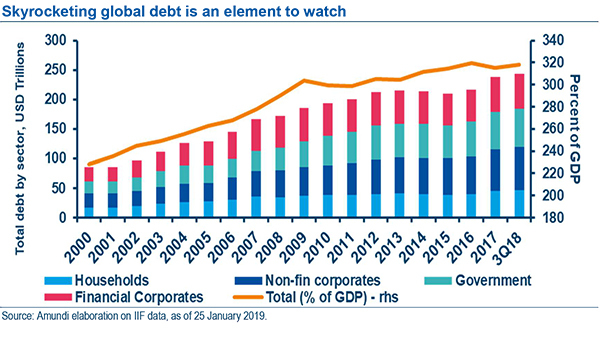 The focus, both in Europe and even more so in the US, where corporate debt is at a historical high, will be in seeking stories with good corporate fundamentals. The high leverage in the system and the deterioration in credit standards are both elements to watch closely and they will require investors to be highly selective on the basis of robust credit analysis. The market went too far, pricing in a recession. While we think risks are skewed to the downside, we have a more balanced view. The fact we are in an economic slowdown is obvious; it started several quarters ago. But central banks are now taking note of it, with their tone gradually becoming more accommodating. It should be pointed out that economic momentum is currently very negative, and it is therefore normal that the probability of recession rises. As is always the case in any correction phase, the probability of recession provided by market indicators tends to overestimate the probabilities calculated by the economic indicators themselves. This excess of pessimism naturally results in a decline in the financial markets and renewed volatility. Based on our calculations, market participants priced in twice the slowdown risk that economic fundamentals justified. The market went too far in December, pricing in a recession, and while we think risks are skewed to the downside, we have a more balanced view. 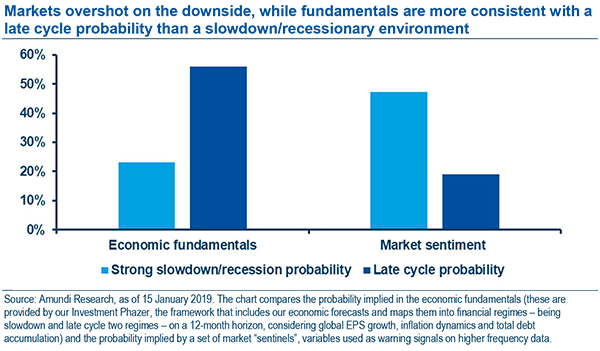 Market participants priced in twice the slowdown risk that economic fundamentals justified. Except in the case of an extreme shock, nothing leads us to bet on a recession in Europe or the United States for the next 18-24 months. We are more inclined towards convergence towards potential growth, with a second half of the year that is more favourable than the first. Therefore, we think risk assets have now reset to more attractive levels (we might see further lows short term in some areas of the market) rather than initiating a bear market. We continue to navigate this “late-late” financial cycle with a preference for risky assets, although some deterioration of earnings per share is entering into our forecast through tighter corporate margins, and eventually milder revenue expectations. 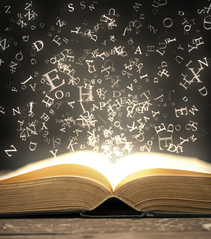 The reporting season has to be closely monitored as it will likely shed some more light from a micro fundamentals perspective. We expect sliding revenues as diminished global trade is already translating into lower sales (in the manufacturing and wholesale sectors in particular). A pause in the Fed’s rates and a weaker US dollar (specifically vs. EM FX) would undoubtedly be extremely favourable elements, just as a decline in the currently very numerous geopolitical tensions would also be positive.The global factors to be closely monitored, however, remain US monetary policy and world trade issues. 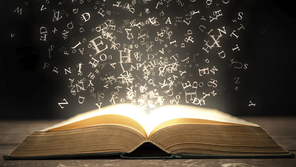 These are important because they are factors common to all economies and financial markets. If the Fed is misunderstood and/or if it goes too far in its tightening cycle, then stock markets will seriously correct and the probability of recession will increase. If trade disputes between China and the United States become a fully-fledged trade war, then growth will collapse into a real recession, the size of which could be similar to that which followed the great financial crisis. This is not our scenario: the Fed will soon halt its cycle of monetary tightening and there will be no “total” trade war. However, this does not mean that in the short term all these risks have disappeared, far from it. 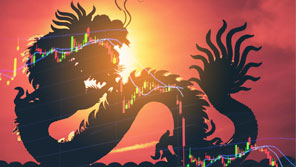 A weakening US dollar, a Fed in wait-and-see mode, long US rates falling (or kept stable), a lull in trade disputes, better growth prospects and a stabilisation of Chinese growth: these are the perfect combination that is likely to become very favourable to emerging markets. In terms of key growth levels, we see a 2% threshold for US growth and 3% for global growth. Europe’s degree of openness maintains its dependence on global growth, while US growth – and its financial markets – is intimately tied to domestic factors. The last item to watch closely is global indebtedness. This problem has not been solved; the strong growth of recent years has simply obscured it. A sharp decline in growth will revive fears. Déjà vu! We think it is time to restart building up risk exposure in the asset classes where repricing has happened and fundamentals are supportive: EM and DM credit. We believe that higher volatility is set to persist amid the end of quantitative easing policies, the deterioration of market liquidity and the diffusion of quantitative investing. In addition, geopolitical uncertainty, trade disputes and unsettled social dynamics will also continue to foster episodes of volatility spikes. 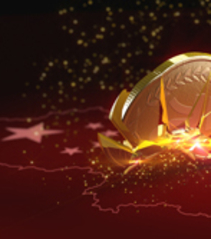 Nevertheless, the combination of monetary policy stances (more patient and flexible everywhere), encouraging tariff negotiations and Chinese authorities proving successful in their resolution to support the economic cycle are all potential triggers to risk assets catalysing a positive reaction (and vice versa to a relevant downside risk should they disappoint). All in all, we think itis time to restart building up risk exposure, but in a disciplined framework, in the asset classes where repricing has happened and fundamentals are supportive, such asEMs and DM corporates. European equities also sold off materially and valuations are discounting an overly pessimistic scenario, but we believe conditions are still challenging at this stage due to the risk exposure on this asset class, with multiple elements of political uncertainty (Brexit, European elections in May) weighing on risk sentiment. We believe that entry points here will materialise later in H1. We rely on our risk monitoring framework to reinforce our conviction. For now, we are maintaining a “positive bias” towards risk assets, knowing that performance targets are lower than in the past. Being tactical and selective will be key. On a long-term horizon,global markets will, on average, deliver lower risk-adjusted expected returns. Economic and stability conditions will be essential. In particular, the high level of total debt and the sensitivity of certain asset classes to these indicators will likely work as discriminating factors. In fact, total debt has been piling up both at a private and a public level globally. Debt dynamics, once faced with rising rates in a mature financial cycle, might be a major catalyst of financial deterioration and instability.Playing sustainable debt stories in a framework of liquidity shrinkage among a maturing financial cycle will be vital. Sensitivity to specific themes (growth, trade, external vulnerabilities and political cycles) will drive selection in the EM space. Fundamentals remained relatively resilient in EMs, even with the generally tighter monetary policy in 2018, with a few exceptions of idiosyncratic stories as a consequence of imbalanced situations, such as Turkey and Argentina. The Fed now turning more dovish, a benign inflation outlook in most EM countries and the widening growth differential with DMs in H2 are all conditions expected to turn in favour of EMs. These factors will help to attract the so-far-depressed interest from investors, particularly considering the very light positioning of the asset class, both in equities and in fixed income. As was the case in 2018, it will be crucial to be very selective and build portfolios around (or avoiding) specific themes (external vulnerabilities, growth potential, exposure to trade issues and political cycles) and corporate stories. Moreover, investors should be aware that phases of volatility will likely re-emerge in the market, due to the news flow on trade disputes and China economic data. EM equities, local currency debt and hard currency debt: this is the ranking by asset class potential returns for the year. In terms of ranking of return potential for 2019, we see equities as the most appealing, followed by EM bonds in local currencies (LC) and hard currency (HC) debt (with LC debt expected to be more volatile than HC debt). This is a change of view compared with last year, when pressure on currencies was too high and we were very cautious on EM debt in local currencies. We have become more constructive on DM credit, being aware that in this phase of the cycle it will be crucial to manage liquidity and credit risk very carefully. 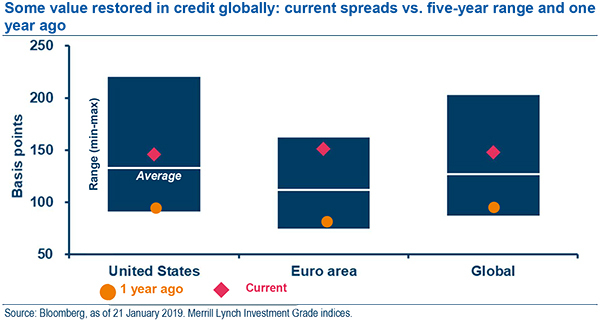 To us, 2018 was a year of scaling back risk and we ended the year with a cautious approach on the credit market; in our view, 2019 is the time to start redeploying some credit exposure, even if with severe selection due to the challenging late-cycle framework and the deteriorating liquidity environment. We have recently become constructive on DM credit, as we think most of the spread widening is behind us in this phase and more dovish central banks (with rates expected to remain lower for longer) will ease pressure on corporate debt. In Europe value has been partly restored and the recent correction process has opened up opportunities. With core bond yields likely to stay low, European corporates represent, in our view, the main brick for yield pick-up in a European fixed income portfolio. The Corporate Sector Purchase Programme has ended but the ECB opened the door to Targeted Longer-Term Refinancing Operations (TLTROs) to avoid excessive tightening of liquidity conditions, which should support the market. In the IG space, the primary market offers a premium linked to the deteriorating liquidity regime. We recommend staying flexible and selective, as it is a crowded space where the bulk of the impact of the unwinding of QE could translate into lower liquidity. In the HY sector, we expect that the main source of returns will come from carry rather than spread compression. However, in this phase of the cycle selection is crucial to manage the trade-off between “security” and yield, so our focus is on risk-adjusted carry. Corporates are priced for higher default rates than the ones we project (for HY, we see default rates in the US and in Europe converging towards 2.5% by year-end) and we see little scope for a meaningful rise in defaults considering the reasonable growth and the fact that the cyclical slowdown encourages a more accommodative ECB stance. In the US, the approach to the credit market is similar, but the phase of the cycle is more advanced. Fundamentals are more challenging than in Europe: the threat of additional hikes in interest rates (we could probably still see one rate hike in the US in H1), Fed balance sheet reduction, leverage in the corporate sector, weaker covenants in the private debt space, the growth in the leveraged loan space and higher liquidity risks. All these factors could be more challenging in case of a material deceleration (or a recession) of the US economy. This is not our scenario for 2019, but remains something to monitor. Fishing the credit and EM pond will be the key to generating returns in fixed income portfolios in 2019, but with a very selective approach and by keeping one’s eyes open. This view is based on the fact that growth will hold up well enough. As these asset classes are not fully priced for a full-blown recession, a lot of emphasis has to be put on monitoring macro developments, as well as bottom-up analysis. For bond investors who would like to lock in higher yields over an appropriate time horizon, and with a diversified exposure to multiple issuers and sectors, “buy and watch” solutions could be an attractive opportunity. In addition, a gradual re-entry intoemerging market equities could be a way to take advantage of long-term investment cases at very attractive valuations. For investors with a longer time horizon able to bear some liquidity risk, we continue to advocate a flexible presence across the credit spectrum, considering also illiquid assets for diversification purposes. In this case, severe selection will be the name of the game, as we admit that the private debt market has soared significantly in recent years, with some deterioration in credit standards (for example, the rise in covenant-lite1 financing, which offers less protection for lenders and looser constraints on borrowers) and the rise in leverage. The recent compression of risk premia of some private issues over listed securities makes more challenging the search for high yielding opportunities that compensate for the higher risk. Demanding credit analysis will be paramount: the slowdown in growth will unveil fragile situations, while opportunities may arise.